Headstones in Greasby need to be sturdy and made of a durable material.Headstones are exposed to the effects of the weather, and as such, need to be durable. After the burial of a loved one, it is prudent to spend some time in choosing the most suitable headstone for the grave. With the many choices that are available, it can be a little overwhelming to select the perfect headstone. We have many years of experience in carving beautiful, long lasting monumental headstones. Our team can assist you in choosing the right headstone for your needs and budget. We can advise on the different types of stone used, and should you require an inscription, we can provide an inscription service as well. Birkenhead Monumental has more than five decades worth of experience in the monumental trade. In Greasby, headstones are designed and made by our team of dedicated staff who consider all the details, no matter how small, in order to create the perfect product. Our family-run business is more than just a headstone display shop. We have recently moved our services to our factory, and this means that we are now able to handle the lettering and design work at one premises, providing our customers with a ‘one-stop’ service. You are welcome to can view the various designs in our display case in order to gain some inspiration on what you desire the final product to look like, or simply choose one of the available designs. When you are searching for headstones in Greasby, we are happy to assist you. We believe in quality, and is apparent in all the headstones we carve. 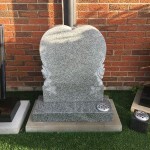 If you are looking for the right headstone for your lost loved one, contact Birkenhead Monumental. You can choose from both traditional and contemporary designs, and have the option of a range of materials such as granite and granite. We take great pride in the work that we do, and this is reflected in the attention to detail and care that goes into the creation of every one of our headstones. We are also long standing members of BRAMM, which is our trade association. It guarantees your security and satisfaction. This entry was posted in Headstones and tagged Greasby Headstones, Headstones in Greasby. Bookmark the permalink.